What the Heck is a Digital Nomad? Every four years since 1930 a group of the world’s best national teams from the world’s most popular sport get together to fight it out for top honors, a shiny trophy, and four years worth of bragging rights. Since 1998 the tournament has included 32 teams. The location is changed for each Cup and determined by a vote by FIFA. 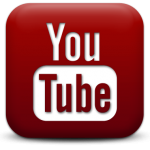 The Fédération Internationale de Football Association, headquartered in Zurich, is the international governing body of association football (aka soccer). It’s full of cheats and crooks (see Qatar 2022 bid investigations). Everyone knows this, but there’s not much to be done about it. This map of the host cities was shamelessly stolen from FIFA, because they are crooks and I don't feel guilty about it. 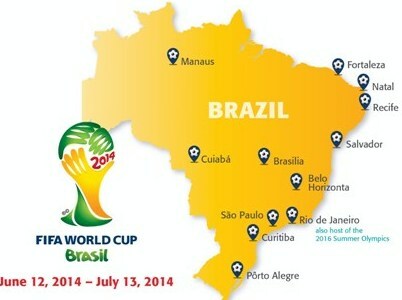 Where Is This Year’s World Cup? Brazil! The World Cup returns to Brazil for the first time since 1950, when the hosts lost a heartbreaker to Uruguay, a loss that still haunts the country’s futebol fans. Twelve different cities have been chosen to host games in new or refurbished stadiums while showcasing Brazil to the world. Wait, Isn’t There Some Kind of Protest/Violence/Controversy? Right. A sizable portion (most surveys indicate over half) of Brazil’s populace has been against hosting the World Cup. The main issue is that the anti-Cup crowd believes the billions of dollars allocated to building new stadiums and tourist infrastructure would have been better spent on programs such as education, public health, and boosting meaningful employment. There have been a multitude of protests, mostly peaceful, though occasionally devolving into more than that. For what it is worth, after over two months in Brazil we can say that the anger is generally directed 100% towards the Brazilian government. Even for those who did not want the World Cup, tourists are still quite welcome. In the Group Stage, the tournament’s 32 teams are divided into eight groups (A thru H), and play round-robin style against the other three teams in their group. The top two teams from each group move on to a single elimination playoff – Round of Sixteen, Round of Eight, Semifinals, and Final. The losing teams from the Semifinals also play a game for third place. How Did We Make It In? All the member countries of FIFA are grouped into six different regional confederations. The details of qualifying vary from region to region, but the USMNT (United States Men’s National Team) emerged from the qualifying round for CONCACAF (Confederation of North, Central American, and Caribbean Association Football) along with Costa Rica and Honduras. Mexico is also in from our region, thanks to an inter-confederation playoff round win against New Zealand. Can We Make It Out of the Group Stage? Well, we unfortunately fell into a “Group of Death,” the perhaps slightly overly dramatic term used to describe a group perceived to be full of quality sides (side = team). Germany and Portugal are ranked #2 and #4 in the world respectively, and Ghana has effectively knocked us out of the last two World Cups, first by beating us in the last group stage game in Germany 2006, then in the Round of Sixteen in South Africa 2010. That said, Portugal is probably overrated at #4 (and Christiano Ronaldo is slightly hobbled) and Ghana isn’t really a great team if we can get over the ghosts of 2006 and 2010. Chances are deemed to be low but existant. Alright, So Who IS Good? Most pre-Cup picks pointed towards Brazil, Germany, Spain, and Argentina as the favorites, though after a first round blowout by the Netherlands over Spain (5-1) we might want to include the Dutch in the conversation as well. What Players Should I Know? The level of talent showcased in the world cup is absolutely ridiculous. If you had to pick some to watch, however, you could do worse than familiarizing yourself with Lionel Messi and Christiano Ronaldo, routinely the best two footballers on earth over the past several years. Keep on eye on Brazil’s Neymar as well; even though his recent play for his club team hasn’t been earth-shattering, he’s still a sparkplug and host Brazil’s most popular player. What Should I Do To Enjoy This World Cup? Skip work to watch soccer all day during the Group Stage. If you can find a group of fellow countrymen to watch with, that would be awesome. If you can find a group of people from all over the world, that would be even better. Bonus Question: What Are the Vangabonds Doing For the Cup? So glad you asked! We are staying in Recife, one of the host cities. We’ve already found a great joint in our neighborhood where we can watch Brazil’s games with the locals. We are still holding out hope we can get our hands on tickets for the USA vs. Germany game here. If not, we will be sure to attend the Recife Fan Fest, a free outdoor venue for fans from all over the world to watch the games on a big screen. 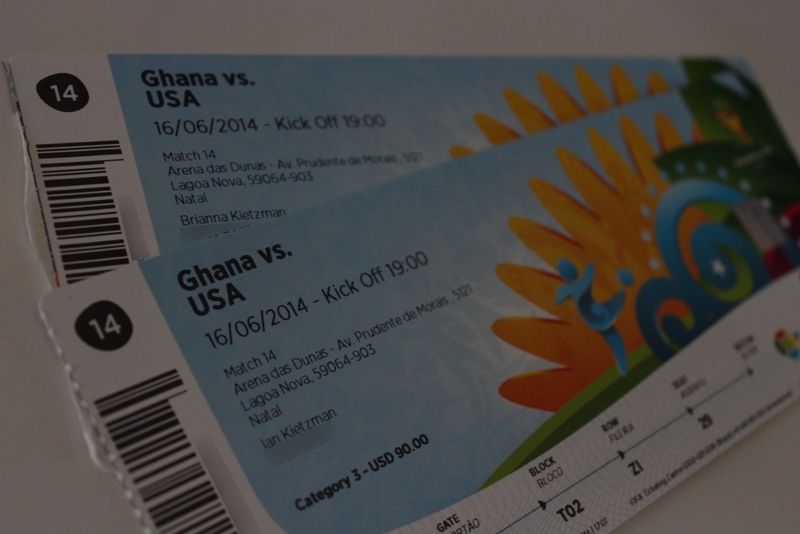 In the meantime, we DO have tickets to the USA vs. Ghana game tomorrow (6/16). Awwwww yeah. Row Z. Be jealous. thanks… although I enjoy occasionally watching soccer.. I really don’t know a lot about it all. Have a great time at the game!